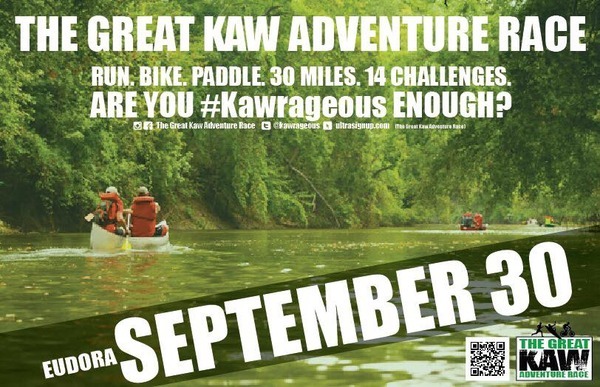 Come and watch the Great Kaw Adventure Race – this Saturday, September 30, 2017 starting and ending in Eudora! 30 miles and 14 challenges for the participants! They run, bike and paddle the Kansas River! FOK will be there – we are providing the canoes along with our partners at Up A Creek Canoe & Kayak Rental to all of the participants including life jackets and paddles. Our FOK Paddle Assistants will be on the river to help as needed, our volunteers will be at the boat ramps to help with gear and logistics, and FOK will have a booth setup in downtown Eudora, so be sure to stop by! 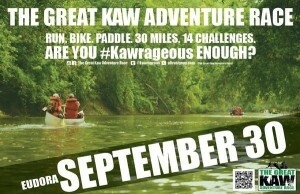 Looking forward to seeing/meeting you all at the Great Kaw Adventure Race!